You have always known that vinegar tasted great on your French fries and made your glassware sparkle, but I bet you didn't know the intense healing powers of this magic liquid. Vinegar has been a trusted home remedy that your mother, grandmother, and their grandmothers have known. It literally can be used from head to toe. Scalp problems such as dandruff, athlete's foot, yeast infections, even headaches are no match for this remedy. It can also be used as a cosmetic to help protect and beautify your skin! 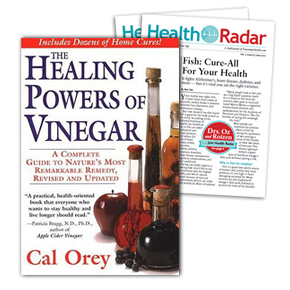 In The Healing Powers of Vinegar, author Cal Orey reveals the secret healing powers of red wine vinegar, apple cider vinegar, and other natural vinegars.